The following article by Jeanette Colby was published in the July issue of the Hill and Lake Press. Stuart Chazin, of Lakes and Parks Alliance of Minneapolis, expressing his concerns at the LRT hearing at Anwatin Middle School. On Tuesday, July 7th, Minneapolis Mayor Betsy Hodges and the Minneapolis City Council’s Transportation and Public Works committee held a community meeting to unveil the “compromise” agreement it had reached with the Metropolitan Council over the $1.65 billion Southwest Light Rail proposal. Despite little advance notice, about 300 people attended the meeting at Anwatin Middle School. Though moving the freight train out of the corridor was integral to the choice of Kenilworth over an Uptown alignment, the “compromise” agreement leaves freight trains in the Kenilworth Corridor. It seeks to ensure, however, that a public entity continue to own the tracks. Without this guarantee, Hennepin County could sell ownership to the highest bidder – and Minneapolis could see greater increases in freight carrying dangerous cargo (long trains currently carry ethanol). The City and Met Council agreed to build a LRT tunnel from near the West Lake station to the Kenilworth Channel – through the “pinch point” and under Cedar Lake Parkway. It would be a cut-and-cover tunnel; large trees and landscaping would be destroyed. North of the channel, freight and light rail would be co-located at ground level; a proposed tunnel in this section was removed from the plan. With the help of a landscape designer, the agreement says, an effort would be made to restore this area to its existing “park-like environment” to the extent possible. A station at 21st Street (East Cedar/Hidden Beach) would be built. After a brief presentation of the agreement, the Mayor and Council members took two-minute testimony from nearly 80 people. 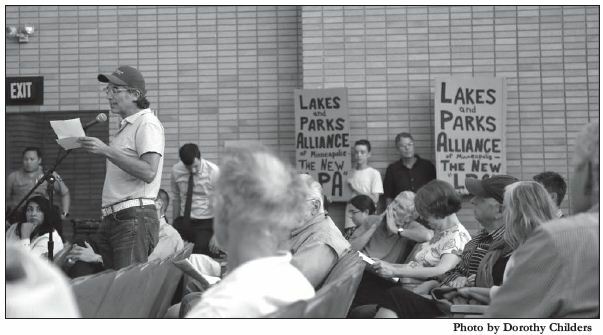 Mr. Chazin, KIAA president Larry Moran, CIDNA president Craig Westgate, and many others urged the City Council not to grant Municipal Consent for the SWLRT proposal until and unless critical questions are answered. “Minneapolis lakes and parks are a critical part of the city’s heritage and livability. The City Council has to take its role as stewards extremely seriously,” said Mr. Westgate. What would happen if the south tunnel cannot be built, either because of water issues or because the tunnel walls would be too close to the Calhoun Isles Condominiums foundations, is another open question. Other meeting participants made comments related to a document, “Equity Commitments for SWLRT,” signed by some 30 organizations, which lists a variety of economic and other outcomes sought by North Side residents. Though most of this document’s specified outcomes have little or nothing to do with SWLRT, it has been used successfully to pressure the Met Council into considering some of North Minneapolis’ transit needs. (The Met Council announced on July 8th that it would commit to building 75 new bus shelters in areas of racially concentrated poverty by the end of 2015 and improve some bus service over the next 5 to 15 years.) Louis King of Summit OIC and others supported the project, citing ambitious goals to train and hire people of color in the workforce associated with SWLRT. The Mayor and City Council members seemed to listen carefully and respectfully to more than 2 ½ hours of testimony. The full City Council will take testimony at a public hearing on August 19th (details forthcoming). The Met Council and Hennepin County will hold a joint hearing on the revised plan on August 13th at 5:30 p.m. at the Minneapolis Central Library. The Minneapolis Star Tribune reported this week that Minneapolis has been given until August 30 to vote on the latest Southwest Corridor light-rail plan. This entry was posted in Southwest LRT on July 30, 2014 by citoyen1789.